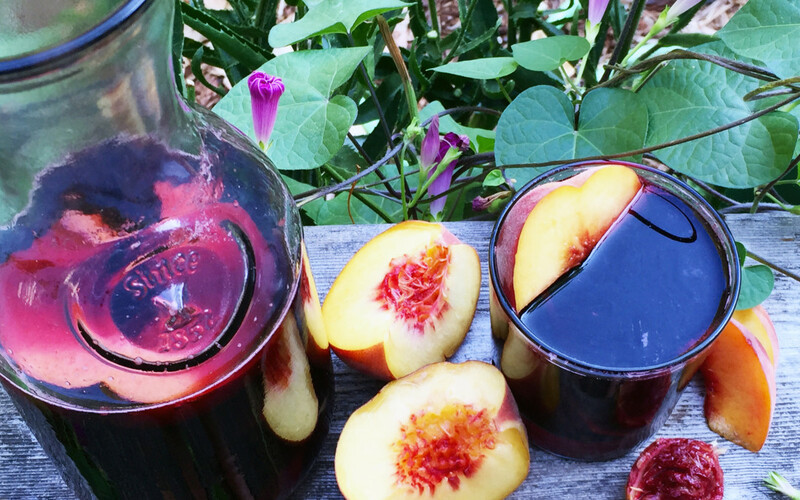 Sangria, a mixture of wine and fruit served chilled is a summer tradition that was brought to the U.S. from Spain. It is a commonly misunderstood beverage that is a usually a mix of fruit punch and headache producing cheap jug wine. As lovers of good food and fine beverages, we are careful to choose a wine that is as good sipped on its own. 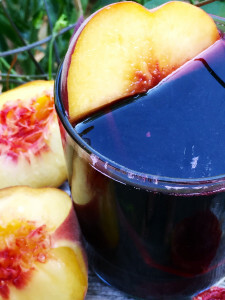 So let’s get real and make a wine and fruit drink that your palate will be happy to experience and your friends if they are lucky and you did not finish it while prepping, will praise and enjoy. 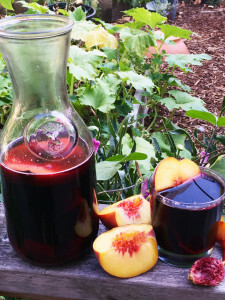 We chose an established Southern Oregon Vineyard to highlight our Sangria escapades. Agate Ridge Vineyard is the result of a family’s tradition of farming, love of viticulture, and education in enology. They are located in the Rogue Valley AVA in Oregon. The unique microclimate at Agate Ridge lends itself to making complex yet traditional wines. The southern facing slopes provide maximum exposure to the sun and the 1350 ft. elevation produce warm daytime temperatures that are perfect for the growth and maturation of the grapes. 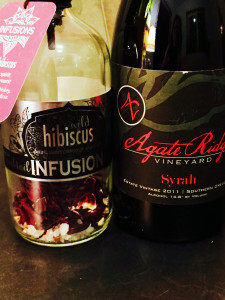 For our first experiment, we decided to combine the tart and spicy flavors in our Wild Hibiscus Infusion with Agate Ridge’s 2011 Syrah. As a varietal, Syrah usually boasts aromas and flavors of wild black fruit, such as blackcurrant, with overtones of black pepper spice and deep earthy notes of toffee and leather. This rich red wine will not disappoint in fact, its depth makes it a smooth sip from beginning to end. After infusing the wine for three days, we emptied the contents into a pitcher, including all the rehydrated flowers and spices. We then added fresh in season chunks of yellow peaches and one Valencia orange, sliced and seeds removed. We put this into the refrigerator for four hours and when it was time to serve we added the remaining Syrah into the pitcher and gave it a stir. Rather than adding sparkling water or ice to the mixture, we like to mix each serving fresh. 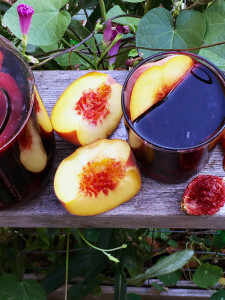 Place a bucket of ice, a bottle of sparkling water, and a bowl of fresh sliced peaches on the table next to it with some lowball cocktail glasses for serving. The result was a complexity of tart herbaceous forwardness with a mouthful of sweet fruit and spice, followed by the rich earthiness of a good red wine grown in the sun and mineral soil of Agate Ridge’s vineyard. 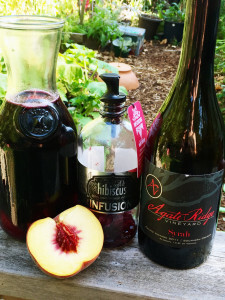 The infusion complimented the wine and the peaches made it luscious but under it all, you never forgot the delicious base of a wonderfully dark and spicy varietal done to perfection by Agate Ridge. For an unforgettable meal, serve this with grilled salmon and sirloin steaks rubbed with rokz Sweet Heat Sugar alongside a hearty mixed greens salad and roasted yams. Don’t forget the fresh ground pepper at the table. And for dessert – grilled peaches and vanilla ice cream. Fill the Infusion bottle with wine and swirl daily. Close the wine bottle tightly and set aside for final assembly. Take the mixture out of the fridge and add remaining reserved wine. Add 8 ounces of sparkling water if desired or add water to each glass when it is served, or do not add water at all.